This article mainly introduces the opening of pcb. Firstly, it introduces opening and bright copper in PCB design. Secondly, it introduces how to realize the tinning of PCB wiring. Finally, it explains the steps of how to set the opeining. What is the pcb soldermask opening? The circuit on the PCB are covered with soldermask to prevent short circuits and damage the device. The so-called soldermask opening is to remove the paint layer on the circuit, so that the circuit can be exposed to tin. The golden finger here is to opeing, plug and play. There is also a very common function of opening the opening, which is to increase the thickness of the copper foil in the later period, which is convenient for excessive current, which is more common in the power board and the motor control board. In the design, customers often ask for opening and bright copper. Because the customer is also ignorant or we are not too clear about this process, it is very troublesome to communicate. In our design, we often encounter customers who need to add shields, partial bright copper on the board side, through-hole open-resistance soldering, copper on the back side of the IC heat sink, and scratch pad. According to the actual situation, let's take a look at several sets of pictures to explain. If the customer needs to add a shield, then all we have to do is add a Soldmask with a width of at least 1mm. If you need to add a stencil, you need to confirm with the customer. At the same time as adding the Soldmask, we need to spread the network copper in the add mask area, and we must cover the Soldmask plane, otherwise the substrate (FR4, etc.) will be exposed. Other non-local networks should not pass through the Soldmask. 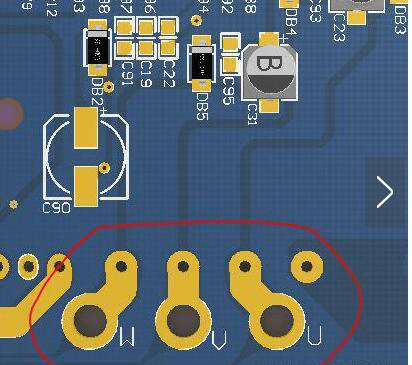 Adding a loosemask area to the pcb effect reveals a yellow copper. Solder mask coverage is provided for areas that are not added. In the design, we often hear the whole plate plug hole or partial plug hole. When adding the hole, we pay attention to the fact that the plug hole company name generally refuels the BGA, and vice versa. ). In general, a company that has a specification of more than 12 mils must use a solder mask opening. Generally, a solder-proof PAD is added on the back of the IC heat-dissipation pad (adding a shoulder mask larger than the surface layer or equal to the surface of the surface pad) and a ground hole, and a copper-clad solder mask is placed on the back surface to better pass the heat of the surface layer. The hole in the hole is transmitted to the back of the copper skin to disperse better. In wave soldering, in order to solve the problem of tin bonding caused by the tight pitch of the pads, we will use the shape of the scratch pad. Note that it is necessary to add copper bumps of the same size as the solder mask while adding the solder mask. In the circuit, it is necessary to drive 8 relays. When the multi-channel relays are turned on, the current is greatly increased. To ensure the actual effect, while widening the current line, it is desirable to remove the solder mask on the current - the green oil layer, and the board is made. In the future, you can add tin to the top, thicken the line, and pass more current. Draw this line in the layer of the top layer (or bottom layer depends on the layer where the preset line is located), and then draw the line that coincides with this in the top solder (or bottom solder) layer. The CB design can be used to set the opening on the TOP/BOTTOM SOLDER layer. TOP/BOTTOM SOLDER (top/bottom solder mask green oil layer): The top/bottom layer is coated with solder resist green oil to prevent tin on the copper foil and keep it insulated. A solder resist green soldermask opening can be placed on the pads, vias, and non-electric traces of this layer. 2, the via hole in the PCB design will open by default (OVERRIDE: 0.1016mm), that is, the through hole exposed copper foil, the external expansion 0.1016mm, the wave soldering will be tin. If it is designed to prevent tinning on the vias and do not expose copper, you must tick the PENTING option in the additional properties of the vias SOLDER MASK to close the vias. In addition, this layer can also be used for non-electrical routing, and the green soldering resistance should be opened accordingly. If it is on the copper foil trace, it is used to enhance the overcurrent capability of the trace. When soldering, it can be tinned. If it is on the non-copper foil trace, it is generally designed for marking and special character silk screen, which can save production. Character silkscreen.